Friday, 06 Sep 2019 at 7:00 PM . From school punk to modern day film producer Richard Jobson has lived a full and colourful life. A harrowing incident as a child that left him suffering with epilepsy but he was a mere 15 year old when he launched the punk rock band The Skids in 1977 with his songwriting partner Stuart Adamson. 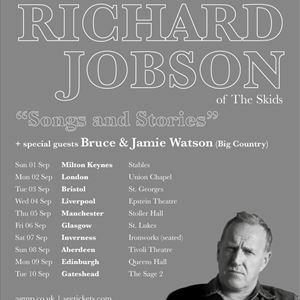 With hit singles including the immortal 'Into The Valley', after four albums The Skids folded and Jobson formed The Armoury Show whilst Adamson moved on to form his new band Big Country. In the 1980s Jobson became a familiar face on television as a presenter on '01 For London' and as film reviewer for Sky Television. In June 2013, he was awarded an honorary degree (Doctor of Arts) from Edinburgh Napier University. With a life that has gone full circle in 2017 he reactivated The Skids. A successful UK tour prompted demand for more shows in 2018 as well as the band's first new album for over three decades, making this the perfect time to write his memoirs 'Into The Valley' which was released in 2018 by Wymer Publishing. Joining Richard tonight will be Bruce & Jamie Watson of Big Country who will perform their own set before joining Richard for acoustic renditions of his back catalogue. Fans of The Skids & Big Country will love this. Book early!